videoconference / webcast on March 1, 2010 7-9 PM (CST) [UTC / GMT: Tuesday, March 2, 2010 01:00 – 03:00], originating from the Harry S. Truman Library & Museum (Independence, Missouri, USA) and the Hiroshima Peace Memorial Museum (Japan). 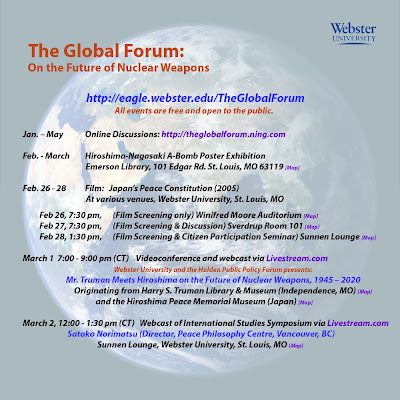 This historic webcast, presented by Webster University and the Holden Public Policy Forum, will be the first meeting between the museum representing the first head of state to use atomic bombs and the people in the city where the first atomic bomb was used. The live webcast and open channels for audience participation via Chat, Facebook and Twitter can be accessed at this link or at other “watch party” locations. The speakers and participants in this meeting discuss the basis for working toward a common vision about the future of nuclear weapons. For the world-wide citizen audience, this event is an awareness raising forum and opportunity to participate in working toward a secure, peaceful and sustainable future for humanity and the planet. This is a Japanese translation (summary) of the Pacific News Center's article "U.S. EPA Calls DEIS 'Environmentally Unsatisfactory.'" Shared by Makiko Sato. See here for the original article. Here is the PNC news report. A new Japan Focus article "Henoko, Okinawa: Inside the Sit-In"
December 25, 2009 With Sakae Toyama, Henoko Tent Village "Mayor"
Read the whole article on Japan Focus. This article was introduced at ZNet too. 日本語版はこちらをご覧ください。 See HERE for the Japanese version. * HANWA is a Hiroshima-based organization working for nuclear abolition. The fundamental issue for the citizens of Hiroshima when discussing nuclear issues is the incomprehensibly vast number of people affected by the atomic bombing of Hiroshima that occurred on August 6 1945. That morning, the atomic bomb instantly killed 70,000 to 80,000 civilians and by the end of 1945, 140,000 residents of Hiroshima had died as a result of the bombing. Many others have subsequently died – often after experiencing a lifetime of suffering - or are still suffering from various diseases caused by the blast, fire or radiation. Hiroshima’s anti-nuclear and peace movements are hence firmly embedded in the understanding that the indiscriminate and mass killing of civilians using nuclear weapons is genocide and that the use of nuclear weapons – under any circumstances – is therefore clearly a crime against humanity. We also regard nuclear deterrence policies to be crimes against peace as explicated by the Nuremberg principle, as “nuclear deterrence” effectively means planning and preparing to commit indiscriminate mass killing, i.e. a crime against humanity, using nuclear weapons. To fail to recognize these fundamental precepts would mean a complete loss of the momentum of our anti-nuclear and peace movements. As advocates for nuclear abolition, as well as citizens of the first city to feel the effects of a nuclear attack, we have frequently been disappointed by the fact that many politicians, bureaucrats and academics engage in discussions on various nuclear issues, including nuclear deterrence and disarmament, neglecting this basic and indisputable fact – that these concepts in fact signify the massacre of a large number of human beings (and many other creatures) using a weapon of mass destruction. They tend to deal with nuclear issues mainly within the frameworks of the “balance of power” between the nuclear states and of international politics. We strongly urge all who engage these issues to place humanity at the center of the problem and never forget the extreme cruelty of atomic bombing when entering into discussions on nuclear issues. “One murder makes a villain, millions a hero. Numbers sanctify.” Henri Verdoux, a murderer, makes this statement shortly before being hanged in the film Monsieur Verdoux, produced by Charlie Chaplin in 1947. It seems that many of us are still influenced by this way of thinking. Indeed, despite countless publications, films and talks on the brutality of atomic bombing over the last 64 years, there is still not a single law anywhere in the world that criminalizes the use of nuclear weapons. We appreciate that, in his speech in Prague in May 2009, U.S. President Barack Obama, clearly expressed his desire to abolish nuclear weapons, stating that “as the only nuclear power to have used a nuclear weapon, the United States has a moral responsibility to act.” Yet the U.S. bears not only a moral responsibility, but also a legal one for having committed the indiscriminate mass killing of Japanese civilians with nuclear weapons. On the basis of a clear recognition of this legal responsibility, we need to establish a universal principle, as well as international law, in which anyone or any government official attempting to use nuclear weapons should be prosecuted as a war criminal. As the world push for the abolition of nuclear weapons has grown, we feel it is now time to take affirmative action to make concrete proposals to establish the Nuclear Weapons Convention. To this end, we offer the following proposals and requests. In July 1996, the International Court of Justice issued an advisory opinion on the legality of the threat or use of nuclear weapons, which concluded that every nation has “an obligation to pursue in good faith and bring to a conclusion negotiations on nuclear disarmament in all its aspects under strict and effective international control.” Encouraged by this ICJ opinion, in 1997 Costa Rica submitted the world’s first Model Nuclear Weapons Convention (hereafter “Model Convention”), which was circulated in the UN General Assembly by the Secretary-General. At the NPT Preparation Conference in April 2007, Costa Rica, in cooperation with Malaysia, submitted an updated version of the Model Convention, proposing the immediate establishment of a Nuclear Weapons Convention. Three NGOs, IALANA (International Association of Lawyers Against Nuclear Arms), IPPNW (International Physicians for the Prevention of Nuclear War), and INESAP (International Network of Engineers and Scientists Against Proliferation) also worked together to draft a comprehensive Model Convention. This Model Convention, which was updated in 2007, includes provisions prohibiting the development, testing, production, stockpiling, transfer, use and threat of use of nuclear weapons, as well as their elimination. ICAN (International Campaign to Abolish Nuclear Weapons) is now promoting this Model Convention worldwide. Thus, the basic framework for a Nuclear Weapons Convention is already available in a concrete and comprehensive manner. We therefore urge all nations – both nuclear and non-nuclear states – to collaborate to speedily establish and ratify a Nuclear Weapons Convention based on the above-mentioned Model Conventions. (2) A Proposal to Add an Article Prohibiting the Use of Weapons of Mass Destruction to the 1977 Protocol Additional to the Geneva Conventions. Although we hope that many nations will soon take action to formalize the Nuclear Weapons Convention, it is expected that it will take at least five years for ratification. We therefore propose that as a step towards putting such a convention into effect, one of the existing international conventions be fully utilized to quickly criminalize the use of nuclear weapons and other radioactive weapons such as DU (depleted uranium) weapons. In fact, in 1957, the International Committee of the Red Cross issued “Draft Rules for the Limitation of the Dangers Incurred by the Civilian Population in Time of War,” which included an article prohibiting the use of incendiary, chemical, bacteriological and radioactive weapons. During the process of drafting the Additional Protocol, countries including Romania, Yugoslavia and North Korea suggested naming the specific types of weapons of mass destruction to be banned, e.g., nuclear, chemical and biological weapons. However, due to political pressures from nuclear powers, in particular the U.S., Britain and France, proposals to include such a provision were eventually rejected. Thus we would propose the addition of a straightforward and simple provision to the Additional Protocol, which would make the ban of the use of nuclear weapons a positive international law. It is uncomplicated and would therefore not require comprehensive discussion to draft the text of regulation. It only requires the political will of the majority of nations worldwide. We could then start drafting a more comprehensive nuclear weapons convention, including provisions to ban the production and testing of nuclear weapons. We also urge the International Committee of the Red Cross and the UN to take the initiative to immediately ban the use of nuclear weapons by utilizing the 1977 Protocol Additional to the Geneva Conventions. This will certainly be a big step towards the abolition of nuclear weapons. We believe that it is vital for the abolition of nuclear weapons to make North-East Asia a nuclear free zone. To this end, we strongly call on North Korea to immediately stop its nuclear weapons development program and China to eliminate all the nuclear weapons in its possession. However, to achieve this aim, it is necessary for the Japanese government to change its policy of relying on U.S. nuclear deterrence and accommodating U.S. military bases on Japanese soil. One of the Democratic Party’s campaign pledges during the September 2009 election was the establishment of an “equal partnership” with the U.S. based on Japan’s national “independence.” Yet, Japan’s new Democratic Party government is essentially using the same policies relied on for many years by the previous Liberal Democratic Party government and is still performing like a “vassal state” of the U.S. It is essential for the construction of a nuclear free North-East Asia to create a stable and peaceful political environment in this region, in which North Korea would feel no need to wage war against neighboring nations. In other words, the construction of “the North-East Asia Peace Community” is a prerequisite for the construction of a nuclear free North-East Asia. We believe that the U.S. and Japan, two nations who together possess extremely powerful military strength that is directed against North Korea, must take the initiative to ease North Korea’s fear of attack by abolishing the U.S. nuclear deterrence policy as well as withdrawing American military forces from Japan, in particular from Okinawa and Iwakuni. The U.K. possesses 160 nuclear warheads and France possesses 300. However, as the Cold War ended many years ago, the role of these nuclear weapons as deterrents against Russian attacks on Western Europe has long been obsolete. In fact there is no longer any strategic necessity to keep nuclear weapons in Europe. Moreover, the majority of British citizens do not think that replacing the existing submarine-based Trident weapons system at huge cost is justifiable. British citizens want to abolish their nuclear missiles. Germany has started working to remove U.S. nuclear weapons from its territory, and the Belgian Parliament adopted a resolution calling on the U.S. to withdraw its nuclear weapons from the country. In short, if the British and French governments move boldly to abolish all nuclear weapons in their countries’ possession, the EU could become a nuclear free zone. We believe that the establishment of a nuclear free EU would have enormous moral and political impact on the U.S., Russia and other nuclear powers, as well as nations currently seeking to possess such weapons of mass destruction. We therefore urge the British and French governments to immediately eliminate all their nuclear weapons. At the same time we wholeheartedly support the nuclear abolition movement promoted by European civil organizations such as CND (the Campaign for Nuclear Disarmament). We believe that the abolition of nuclear weapons cannot be achieved so long as the so-called “peaceful use of nuclear energy” continues. Some claim that the use of nuclear energy is a good strategy to tackle global warming caused by human-made carbon dioxide. However, we need to consider the many problems associated with the use of nuclear energy, including the enormous cost of the construction and operation of nuclear power stations and other related facilities, the question of dealing with large quantities of radioactive materials including the problem of storing high-level radioactive waste over many hundreds of years, the uneconomical and dangerous “recycling of nuclear fuel,” and the danger of nuclear accidents which would cause great harm to human beings and the natural environment. If we take these problems into account, it becomes clear that there is no credibility in the argument for the so-called “economic advantage” of nuclear energy. We therefore believe that the use of nuclear energy, which is directly linked to the production of nuclear and DU weapons, should be stopped immediately, and that the huge sum of money currently allocated for nuclear energy should be redirected towards the development of various alternative and environmentally friendly energy sources. The creation of a safe environment is an important part of our peace movement, as is the protection of the natural environment that secures the harmonious co-existence of all creatures on this planet. It is often said that there is a danger that terrorist groups may acquire nuclear weapons, and President Obama also repeats this possibility in his public speeches. Indeed, Obama has essentially inherited Bush’s “war against terrorism” without any fundamental changes, and is hence conducting military operations for this purpose in places such as Afghanistan and Pakistan. However, the largest number of victims of these operations are not the so-called terrorists but ordinary civilians. Many civilians have been killed or injured by aerial bombings conducted by U.S. forces in these countries, and as a result, these people, who have lost their families and relatives, have become refugees. We, the citizens of Hiroshima, the city that experienced one of the most horrific of indiscriminate bombings, cannot remain silent about the similar bombing of civilians conducted by countries like the U.S. and Israel. It is clear that so-called “structural violence” – poverty, discrimination and the abuse of human rights, for example – is the real cause of terrorism. The war against terrorism, which inevitably creates a large number of civilian causalities, makes more civilians poverty-stricken and creates massive numbers of refugees. The desperate and demoralizing social conditions thus created are becoming further incentives for terrorist activities. The best tactic to prevent terrorist groups from acquiring nuclear weapons is therefore not waging a war against terrorism but eliminating the source of this “structural violence”. We therefore call on countries such as the U.S., Russia, France, the U.K., China and Japan to reallocate their large military budgets to helping the huge number of people in the world who are in desperate need of assistance for their survival. Although this kind of policy may give the impression of being a round-a-bout way of tackling the problem of terrorism, we believe that building a peaceful and stable society is the best and most effective approach to this serious problem. The above-mentioned demands and proposals are all essential for the ultimate abolition of nuclear weapons. Yet we strongly believe that they are all achievable, provided we place humanity at the center of our activities. As the NPT Review Conference approaches, we are determined to work together with all groups and peoples actively involved in anti-nuclear and peace movements all over the world, fully utilizing our experience as residents of the city that fell victim to the world’s first and deadliest nuclear attack. There are two important events in Tokyo on March 20, coincidentally at the same time. To those in Tokyo, make sure you go to one and your friend goes to the other! 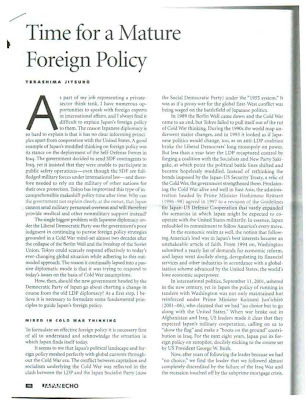 Here is an article by Jitsuro Terashima, a close foreign policy adviser to Japan's Prime Minister Yukio Hatoyama. Terashima has been general manager of the Washington DC office of Mitsui & Co. and President of Mitsui Global Strategic Studies Institute. Terashima is now Honorary chairman of the Japan Research Institute and president of Tama University. His suggestions for building a more independent, mature, and creative relationship with the US in the post Cold-War era are noteworthy. You can click each picture for a larger view. 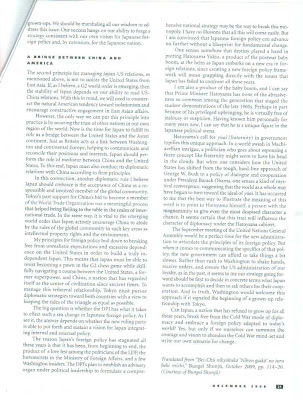 This article appeared in the December 2009 edition of Japan Echo and is a translation of the original Japanese article "Bei-Chu nikyokuka 'Nihon gaiko' no toru beki michi," (『米中二極化「日本外交」の取るべき道』文芸春秋２００９年１０月号), October 2009, PP. 114-20. Please feel free to comment. For English information, see HERE. See HERE for the English version. This is a statement in preparation for the 2010 NPT Review Conference by HANWA, Hiroshima Alliance for Nuclear Weapons Abolition. Shared by Yuki Tanaka, Professor of Hiroshima Peace Institute, Hiroshima City University. BOTH the U.S. and Japanese governments have equal responsibilities to respond to every issue raised by Guam pertaining to the Marines’ relocation, but the people of the island must learn to be more assertive, according to Japanese parliamentarian Mikio Shimoji. Shimoji doesn’t dismiss the possibility of Guam officials directly approaching the Japanese government for assistance. He said “it is a mistake” on the part of the U.S. government to ignore the cost that will be incurred by the local community as a result of the military buildup. “The U.S. government clearly said that they are not enthusiastic about doing anything outside the fence. It is wrong,” Shimoji said through an interpreter. “You must continue to raise your voice; it’s not too late. You have the right to raise your voice to the government of Japan, as well,” he added. Shimoji is the chief of the policy making board of the New People’s Party, one of the partners in Japan’s center-left ruling coalition. He is among the members of the Japanese Diet who arrived on Guam last night to assess the island’s situation and evaluate its capacity to handle the over 8,000 Marines and 10,000 dependents who will be relocated from Okinawa to Guam. He was accompanied by fellow House members Abe Tomoko, Hattori Ryoichi and Yokota Syozo, who all represent the Social Democratic Party. The Japanese delegation met last night with Speaker Judi Won Pat and Sen. Tina Muna-Barnes during a dinner reception hosted by Ken Haga, president of the US. Explore & Study, Inc. at the Holiday Resort. “Our sentiment three years ago is not the same as our sentiment today,” Won Pat told the Japanese parliamentarians. “Three years, the community might be pro-buildup, but that sentiment has changed after realizing its impact based on what we have read in the draft environmental impact statement,” Won Pat said. “I’m beginning to understand Guam’s situation more,” Shimoji said, as he noted the parallelism between Guam and Okinawa, which are both geographically and politically isolated. “Guam will now be sharing the burden of Okinawa,” he said. As to the lack of military transparency on the planning process for Guam buildup, Shimoji recalled that Okinawa experienced the same exclusion when the U.S. bases were in the process of being installed on the island. “The U.S. did not disclose the process,” he said. “So, it’s history repeating itself,” Barnes said. “We can’t let history repeat itself. We have to join forces to prevent it from happening again,” Shimoji said. The delegation is scheduled to visit the base facilities today before meeting Gov. Felix P. Camacho at 2 p.m., but the Japanese officials said they are willing to cancel some of their appointments so they can meet with members of the legislature today. They are leaving tonight. 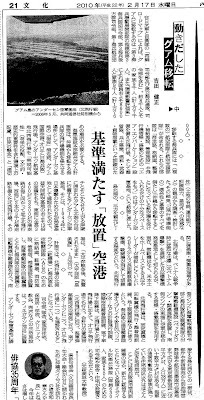 This is about the new book on the U.S. plans to move Marines in Okinawa to Guam, written by Yoshida Kensei. See top left corner of this blog for the list of important articles regarding the US Military Bases in Okinawa and the current controversy over the "relocation" of Futenma Air Station. I hope to post more information in English later about this book. Mayor of Ginowan City, where Futenma Air Station is, gave a talk in Shiga, near Kyoto, organized by an NGO. The room with capacity of 250 was packed and overflowing, so Y.K. predicts there were probably 270-280 people. Ginowan Mayor Iha, based on the extensive research on the U.S. documents, argues that the U.S. is planning to move most of the Okinawa Marines to Guam and Tinian, so there is NO NEED to build another base in Henoko, or anywhere in Okinawa or the rest of Japan. For details of this argument available in English, see Iha's interview article and also Tanaka Sakai's article in the on-line journal Japan Focus. "Guam cannot accommodate all training for the relocating Marines. Tinian is approximately 100 mi (160 km) away and provides the best opportunities for training groups of 200 Marines or larger due to greater land availability. It provides reliable access and maximum opportunity to realistically train with their weapons and equipment while minimizing “down time” lost when travelling to training locations. The northern two-thirds of Tinian are leased to the DoD. Company and battalion level non-live fire training　areas already exist and are utilized on these lease parcels. The land, however, could be developed to accommodate live fire ranges. " (b) Develop and construct facilities and infrastructure to support training and operations on Guam and Tinian for the relocated Marines. 2. Navy. Construct a new deep-draft wharf with shoreside infrastructure improvements creating the capability in Apra Harbor, Guam to support a transient nuclear powered aircraft carrier. 3. Army. Develop facilities and infrastructure on Guam to support relocating approximately 600 military personnel and their 900 dependents to establish and operate an AMDTF. " Here is the poster for the St. Louis/Independence, Missouri series of events on nuclear disarmament and Article 9. It is historic that a nuclear disarmament meeting will take place at Harry Truman Museum and Library, with the involvement of Hiroshima Peace Memorial Museum. Tadatoshi Akiba, Mayor of Hiroshima and Steve Leeper, Director of Hiroshima Peace Foundation are among the speakers of the evening. Another focus of this event series is Article 9, Japan's war-renunciation constitutional clause. John Junkerman's "Japan's Peace Constitution" will be screened several times and we will talk about the international, and historical/current significance of the "no-war clause" of the constitution. We will be back with more information. Here is Ten Thousand Things blog's excellent summary of the military colonization of islands throughout the Pacific Ocean. Ten Thousand Things is the best source for more information on Okinawa, Jeju, Guam,and Hawai'i, with rich resources and links to issues in peace and sustainability. Why does the U.S. government--which already controls a global military empire of over 1,000 bases--have an out-of-control appetite for more and bigger military bases, many of them located in places where locals do not want them? Does the US wage wars simply to acquire territory and create justification to build yet more military bases in these places--Iraq, Afghanistan, Pakistan, Yemen? And how is it that most Americans remain unaware of this vast network of military bases and what it entails: confiscation of land from unwilling landowners; unceasing demands for base closures by locals (in the case of Okinawa, for more than sixty years); military-caused crime & violence (including rapes and deaths); environmental pollution and health issues created by the bases and weapons testing; and other "collateral damage"? And why is the US engaging in military expansion throughout the Asia-Pacific--a region of relative and stable peace since the 1970s when U.S. forces withdrew from Vietnam? The US already has around 100 military installations in Japan and Okinawa. This includes Kadena Air Base, the largest US military base in Asia. Why does it need new helipads in a pristine Okinawan forest? The US already has at least 40 military installations in Korea. Why does it want the South Korean government to destroy a coral reef in Jeju Island--a World Heritage site because of its rich and untouched biodiversity--to build another naval base? And the US already has military bases covering 1/3 of the island of Guam. It's a huge stretch to consider China a military threat to the US when it is America's largest foreign creditor and given the immensity of economic integration between the two nations. 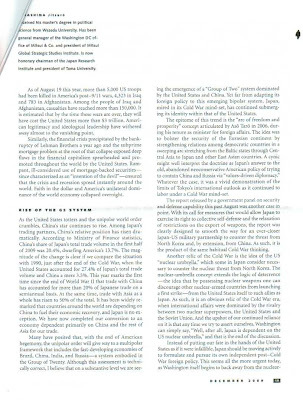 In the early 1990's, political sensationalists unaware of the level of economic integration between the US and Japan predicted a US-Japan war "within twenty years." In hindsight, this appears sillly. Now similar pundits are saying the same about China. Similarly, China is Japan's top trading partner. Moreover, the Hatoyama administration has already eased tensions that the former Koizumi-led government created with its theatrical visits to the Yasukuni war shrine and differences with China over memories of Japan’s fifteen year invasion (1931-45) there. And North Korea may have an atomic bomb and a missile that can reach South Korea or waters near Japan. But if it ever engaged in such a suicidal attack--the US, Japan, and S. Korea would respond with nuclear and conventional power more than sufficient to destroy N. Korea. More bases, weapons and war games are overkill. The only solution is diplomatic engagement. Why put beautiful and environmentally sensitive Jeju Island, Korea; Takae (Yanbaru Forest) and Henoko, northern Okinawa; and Guam under threat of new, larger and technologically advanced US military presence--where residents are adamantly opposed--when these bases are not needed? What is the purpose of the new US military bases planned for Okinawa, Guam (and the South Korean naval base intended to port U.S. and South Korean Aegis destroyers outfitted with missile defense systems at Jeju Island)? Do they make sense to anyone besides those still infected with Cold War hangover imaginary fears? For almost a century, ever since the US seized control of the Philippines in 1898, the US had a military presence there. Its two major bases of the post- World War II era were Clark Air Force Base and Subic Naval Station--once the US' largest military installations in Asia. But after the 1986 fall of Philippine dictator and loyal US ally Ferdinand Marcos, Filipinos voted in 1991 to kick out the US military and the US was forced to relinquish both bases. After the fall of Saigon, in May 1975, the Royal Thai Government asked the US to close its military bases and remove all of its combat forces (27,000 troops, 300 aircraft) by 1976. In the late 1990s, Thailand also rejected new US requests to establish permanent military bases there. The US has nevertheless continued its military expansion in the territories of more docile Asian governments and colonies--frequently overriding the political will of the citizens and residents of those places. Most families in the Marianas have family members serving in the US Armed Forces. The younger generation that has had the benefit of a college education is starting to push people to recognize the larger context -- but their culture is one that is based on a huge amount of respect for the elders (manam'ko), and the generation from the Pacific War - on Guam, anyway - still feels an enormous sense of gratitude to the US Marines for saving them from the Japanese Imperial Military. But because of the US' latest move to expand the bases to over 40% of the island, many Guamanians--especially the indigenous Chamoru and younger people who are concerned abou future water issues as well as a negative impact on Guam's beautiful natural environment and tourist industry--are resisting. Their opponents include a huge transnational military construction industry packed with contractors already bidding for projects. So now, we're witnessing local residents struggling to protect land rights; sensitive, biodiverse natural environments; and democratic processes--versus unnecessary military expansion fueled by international pork barrel politics--in Jeju island, Okinawa, and Guam. 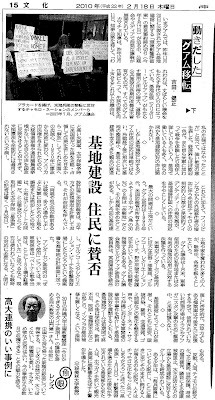 This is an article on the Futenma issue, shared on the Japan Forum, an on-line discussion forum of the National Bureau of Asian Research(NBR), a US-based think tank on Asian policies. It is written by Peter Ennis, a US correspondent of Weekly Tokyo Keizai, a Japanese business journal. His insights based on the background interviews with the key players are noteworthy. The original article is here. Below are some highlights (with my highlights in red) with a few comments. "There is much more debate within the Obama camp about Futenma than meets the eye. And there is also serious talk about the need for a "Plan B" in the likelihood (90% in my view) that the Hatoyama government rejects the Henoko plan. " This "Plan B" was mentioned by Armitage during the "Japan-US Security Seminar"sponsored by several organizations including the Embassy of Japan. The YouTube link is at the "Okinawa 2010" video project. "Overall, the tone and direction of Obama policy on Futenma are set by Campbell, Gregson, and Bader. The key outside voices are from Mike Green, and former Deputy Secretary of State Rich Armitage. " "...not everyone from Team Obama agrees with the insistence that Japan proceed with the Henoko agreement. The Futenma issue has caused a significant rift (not personal, nor acrimonious, but substantial) among Japan specialists who have worked together for over 15 years to upgrade the alliance. " "Some of the dissenters were..Sheila Smith of the Council on Foreign Relations, Ambassador Rust Deming now as SAIS, long-time Japan specialist Bill Breer, Columbia University's Gerald Curtis, and Harvard's Ezra Vogel." widely-read op-ed in the New York Times. It is hard to over-emphasize how important Nye had been to Campbell, Green, and Armitage. It was Nye, working within the CIA and Pentagon, who listened carefully to subordinates, and then allied with Armitage, urging an upgrading of the alliance. Nye personally brought Campbell to the Asia position at the Pentagon in 1994. That’s why it was so important to notice the decidedly different views – at least in public – expressed by the two." back to 1994, and someone highly-regarded for his independence,"
Referred to the refuelling mission in Indian Ocean which became "a lightning rod in Japan for the DPJ's effort to battle the LDP." "Armitage, Campbell, and Green were demonstrating a surprising tin ear to the mood in Japan, a tin ear to the extent to which the Iraq war had seriously, dangerously undermined Japanese confidence in the US. To push Japan to continue an essentially meaningless mission, and to make continuance of the mission some kind of litmus test of Japan's commitment to the alliance, would only backfire." Ennis argues that the "tin-ear approach" would not work any more. "In my view, the key people pushing the hardline on Futenma terribly underestimate the breathtaking extent of change now underway in Japan. For the DPJ, anything considered sacred by the LDP has to be looked at. That's fair, it seems to me, as long as it is done in a responsible way.... that's a process the US should engage, not try to muzzle." "ONE: Interservice rivalries. From the beginning, the US Air Force and the US Marines heatedly argued against merging Futenma's operations into the US Air base at Kadena. Skipping the (admittedly existing) complications, I have no doubt that if the President said "get it done," the Marines would be up at Kadena in no time -- and with no where near the reduction in operational capabilities they claim would be entailed." Kurt Cambell favoured this Kadena plan in 90's but lost, because "A Washington that is now sending young Marines into battle in Afghanistan is not in the mood to tell the Marine Corps leadership to come up with an alternative to Henoko." "TWO: The role of Congress. As it is, there are cost-overruns on the huge expansion of military capabilities on Guam. It would not be easy -- short of spending a lot of political capital -- to go back to Congress and say more Marines than expected will be going to Guam." "THREE: Doubts about the DPJ. In a public forum in Washington recently, Armitage asked whether the current opposition to the Henoko plan might be a dangerous prelude to criticisms of all US bases on Okinawa. That concern can not be ignored, but the answer, it seems to me, mostly depends on attitudes of the US and Japanese governments: a willingness to give clear, strategic reasons for basing arrangements, and to honestly work to reduce the enormous burden on Okinawa." Lack of clarity and strategic reasons for basing arrangements are apparent. Both US and Japanese governments avoided the fundamental argument over the effectiveness of Marines in Okinawa as deterrents. See Yanagisawa and Gabe. 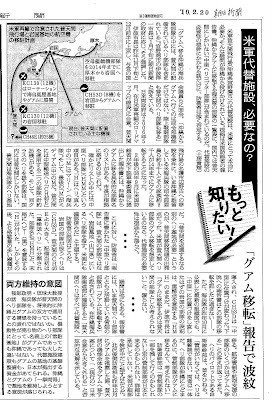 For Japanese readers, see Sato's arguments and also the recent Ryukyu Shimpo. Hatoyama has not exactly been clear about his strategic vision, and has come no where close to erasing doubts that, deep down, he still favors "an alliance without bases," which he advocated back in 1996. It is essential that Hatoyama provide more clarity, if the DPJ expects flexibility from the US side." Hatoyama, asked about "an alliance without bases" in mid-December 2009, unfortunately said "I used to think that way, but now that I am Prime Minister, I had to put a seal on that idea." "ONE: Why are the Marines necessary on Okinawa? TWO: Where does Japan, newly-liberated from the LDP, plan to take its own security policy, and, in that context, the US-Japan alliance?" Why Marines in Okinawa? "Deterrence"? Marines from Okinawa is going to embolden China or North Korea. The US deterrent in Northeast Asia is based, fundamentally (and virtually irreplaceably) on the US Air Base Kadena, and the US naval base Yokosuka. Behind them, as the build up occurs, is Guam, where three US attack submarines are based, F-22s are based, enormous amounts of weapons are based, and where there will soon be a lot of Marines who can move quickly." By the way, we now know that number "18,000" is just in our head; the actual number is around 11,000, and probably less at any given time. See Iha. "Do 18,000 Marines on Okinawa really defend Japan? Of course not. Ichiro Ozawa has said that, at this point, Japan should be able to defend herself against an invasion." "Do 18,000 Marines really deter North Korea? There is some room for argument here. Some US officials will argue that there are very conceivable scenarios in which the Marines could play a key role. For example, in the event of a chaotic collapse of the North Korean regime, with potentially hundreds-of-thousands of people in need of relief, the Marines might be called on to seize North Korean ports to ease the delivery of humanitarian relief aid. That is a very legitimate concern, and there are others of a similar sort. But a chaotic collapse in the North would not be a split second occurrence. Marines from Guam, or even Hawaii could get there in a matter of days, before which a regime collapse in Pyongyang would have become obvious. This is not to minimize logistics, which is why the US and Japan should agree way ahead of time on pre-positioning of supplies and access to key bases (airfields, possibly even a Futenma that quietly remains open for contingencies...) "
"But deter North Korean aggression? There is no credible argument around today that South Korean ground forces would not hold their own in the event of a North Korean invasion. South Korea currently has deployed along the DMZ more active-duty infantry forces than exist in the entire US Army and Marines combined worldwide!!" "A North Korean invasion of the ROK would be quickly beaten back (albeit in the midst of terrible devastation) by ROK ground forces, and US air and sea based artillery capabilities. BTW: The ROK has very capable Special Forces that could seize control of North Korean ports in a crisis. Whatever shortfalls may exist could be rectified by US-ROK training cooperation. " "Similarly, the Marines are on Okinawa for legacy and bureaucratic reasons (including budget: Japan pays a lot of the cost for stationing such a heavy US Marine presence in East Asia...). That may sound terribly disrespectful, and it is not intended that way, at all. The Marines have to have a huge presence in the Western Pacific. The entire region needs to know that the US is there to provide the "oxygen" of security (in Joe Nye's words). They need to be in a place from which they can quickly respond to crises, such as earthquakes, terrorist troubles, etc., and also be able to train, and have good conditions for downtime. The question is: WHERE? Does it have to be Okinawa? ". "But the notion that the Marines are an indispensable part of the US deterrent in East Asia is not credible. ....The DPJ knows that, and the more the US insists on making that argument, the less likely there will be an agreement any time soon. " In summary, Ennis is saying that there are no credible reasons to believe that Marines are effective deterrents in Okinawa or anywhere in the Pacific, that they are costly, that they are there just for legacy and bureaucratic reasons, and the only marketable reasoning is that they are there for providing humanitarian aid in case of emergency, but even that doesn't explain why they need to be in Okinawa. His arguments are consistent with Sato, Gabe, and Yanagisawa. At the end he comes up with three possible solutions for US and Japan to "get out of this" - 1)endorsing and defending Kadena and Yokosuka, 2) "Co-basing" option, and 3) re-branding Marines as a multi-tasking force for humanitarian and counter-terrorism unit, though hinting that Marines themselves wouldn't want to buy that. 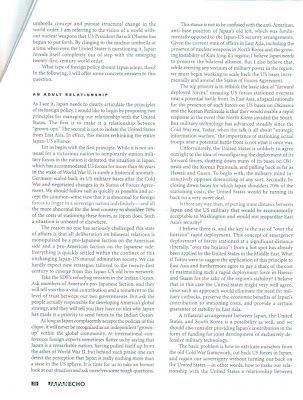 Ennis is still pro-alliance (military alliance) and his suggestions are more for saving the bilateral relationship from this mess and strengthening that alliance than for re-examining it or for the ultimate goal of eliminating US bases from Japan, an idea that should have been pursued by Hatoyama even after he became Prime Minister.